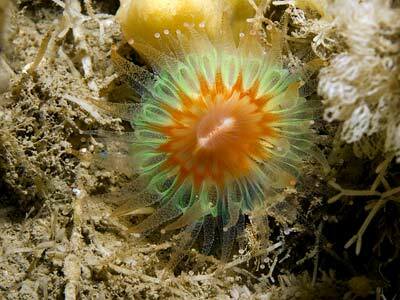 Description: This species is a solitary stony coral (although it may occasionally grow on old dead corals) . The corallum is cup-shaped, very dense in texture, up to 25mm in diameter. 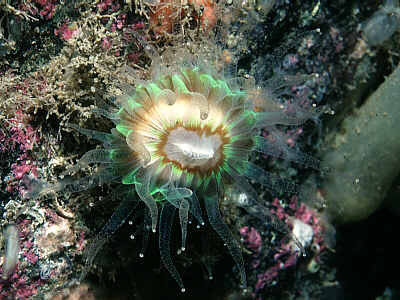 The polyps are translucent, with spherical knobs at the ends of the tentacles. The colour is very variable; white, orange, pink, red, green, brown, etc., usually with a contrasting zig-zag ring around the mouth. Specimens from deep water (c. 50m +) may be wedge-shaped with narrow bases, attached to rocks or lying free on the bottom. 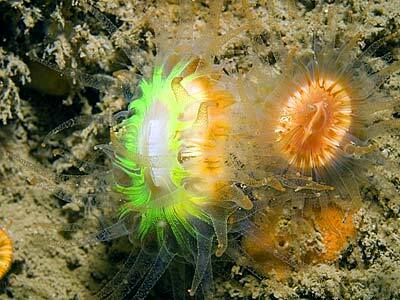 Habitat: Lives on rocks, stones, shells, etc., from the lower shore to 100m or more. Distribution: Common on west coasts of the British Isles north to Orkney, occasional in the North Sea on the east coast of Scotland; southwest Europe and the Mediterranean. Similar Species: If growing in clusters Caryophyllia smithii may possibly be confused with Hoplangia durotrix, however the latter is rare in the British Isles and C. smithii is much larger and different in structure. Solitary corallites of dense texture. Picton, B.E. & Morrow, C.C. (2016). Caryophyllia smithii Stokes & Broderip, 1828. [In] Encyclopedia of Marine Life of Britain and Ireland.